AM CVn (pronounced A M Can Ven) stars are white dwarf-white dwarf binaries in very close orbits. Only about 24 of these systems have been discovered, all with orbital periods between 5 and 65 minutes. Their orbital separation is so small that the less massive white dwarf has filled its gravitational potential well, or Roche lobe, and is transferring mass to the other white dwarf. There are three ways that astronomers believe AM CVn systems can form. 1) The two stars are initially massive and therefore quickly evolve into white dwarf stars separately. Through the loss of angular momentum through gravitational wave radiation, the period decreases until the less massive star fills its Roche lobe. 2) A low-mass, non-degenerate helium star transfers enough mass that it becomes semi-degenerate. 3) The mass donor of a cataclysmic variable loses enough mass that it becomes semi-degenerate. Since all of these processes take at least hundreds of millions of years, astronomers have not yet determined which of these formation scenarios actually occur in the universe. This paper presents the observations of two systems that will turn into AM CVn systems. This is the first time the progenitors of AM CVn systems have been found. Figure 1: Lightcurve of system J0751. The bottom shows a closer view of the minima of the lightcurve. The blue line shows the expected variations from just ellilpsoidal modulations. The red line shows the expected variations if an eclipse is included in the system. The authors observed a system called J0751 (shown at left) for 63.2 hours and a system called J1741 for 13 hours. 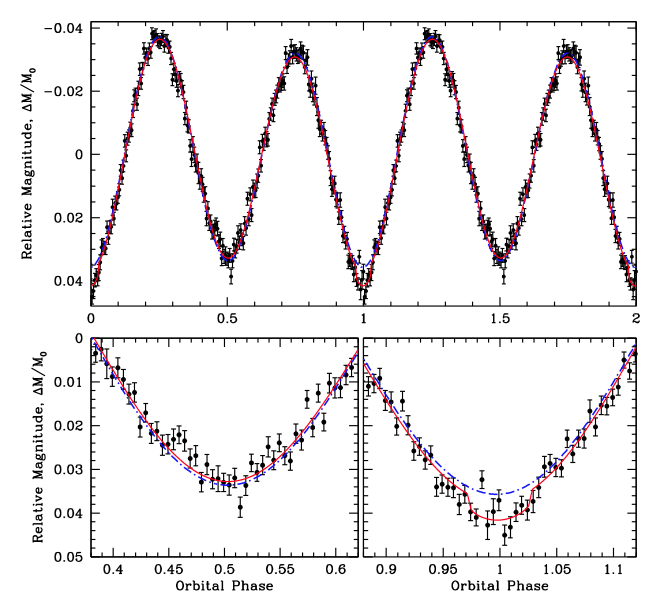 The observed variation in the displayed lightcurve is caused by ellipsoidal modulation of the less massive white dwarf. That white dwarf is distorted due to the gravitational influence of its companion, causing it to be football shaped. As it rotates, the amount of visible surface (and thus its brightness) changes. The authors also detected an eclipse in the system. The bottom portion of Figure 1 shows the eclipse, making this system only the fifth eclipsing double white dwarf system known. Modeling the lightcurve gives very good constraints on the masses and radii of the white dwarfs in both systems. Since the masses and orbital periods of these two systems are well constrained, the authors can predict what the future has in store. Gravitational radiation will cause the system to lose energy and angular momentum, causing the two white dwarfs to get closer to each other. Once they get close enough, the lower mass white dwarf will fill its Roche lobe and begin transferring mass to the more massive white dwarf. This mass transfer can either be stable, where the system will transfer mass for many years, or it could be unstable, when the star giving mass dumps it very quickly. The relative masses of the two stars determine whether the mass transfer is stable or unstable. Figure 2 shows the different ranges for these two options. 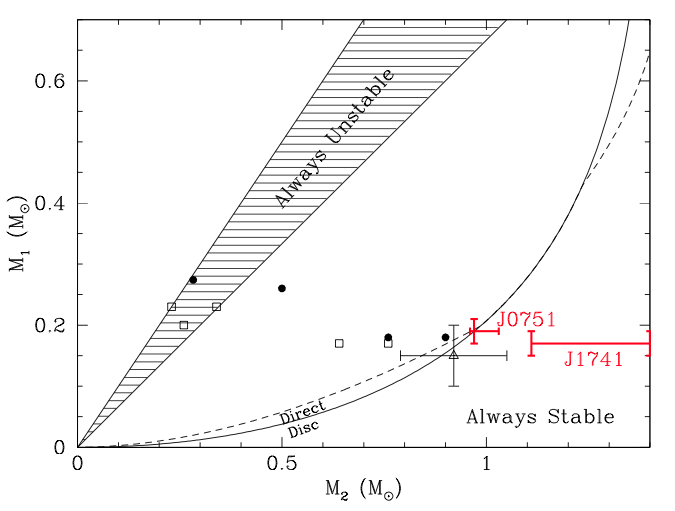 J1741 clearly falls in the stable mass transfer region. Therefore, the authors this system will turn into an AM CVn in about 160 million years. This is the first known progenitor of an AM CVn. The future of J0751 is more uncertain. The mass measurements are not precise enough yet to declare this system to be one or the other. Either way, J0751 should begin mass transfer in 270 Myr. Figure 2: The stability of mass transfer in double white dwarf systems is shown as a function of the masses of both stars in the system. The shaded grey area is for unstable mass transfer. The solid line is the division between an accretion disc being formed and mass being transferred directly onto the white dwarf. In between these two extremes, the stability of mass transfer depends on other parameters of the system. The two systems discussed in this paper are shown in red. The other data points are from other known double white dwarf systems. As AM CVn systems transfer mass, a helium layer forms on the white dwarf photosphere. Once this mass builds up enough, to about 0.1 solar masses, it will ignite. These ignitions are powerful enough to begin nuclear reactions and form radioactive elements, similar to what occurs in Type Ia supernovae. However, these ignitions in AM CVn systems do not contain as much energy as Type Ia supernovae, and so are often called Type .Ia supernovae. The authors think it is likely that both of these systems will explode as Type .Ia supernovae a few hundred Myr after they begin transferring mass. Exploding diamonds in the sky Astronomers like Easter egg hunts: studying a unique star system in the infrared Weathering the storm or rising from the ashes? The circumbinary planets of NN Serpentis A Contracting White Dwarf?